"In the beginning there was noise, from noise began rhythm, and from rhythm began everything." Big Bang’s core strategy is to deliver an alternative and inspirational understanding of the cultural and historical origins and development of music and pop culture, through music workshops for children and young people (and those who are less young!). 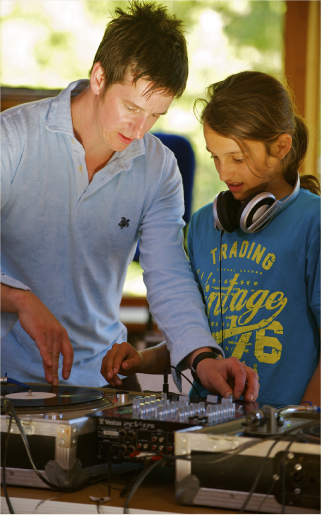 Using turn tables, a multitude of vinyl, drum kits, microphones and percussion from around the world, Big Bang music workshops are designed to be welcoming, fun and non-intimidating. Offered across the uk the workshops can be run for groups of between Five to twenty, and ages 2-92. They energize, uplift and create positive experiences for all active participants. Music workshops are tailored to your needs. We come to you with an array of drums, percussion, Dj set up- decks and vinyl. The workshops can be tailored to all age groups. Workshops run for half a day or one day; and often end in a group performance.